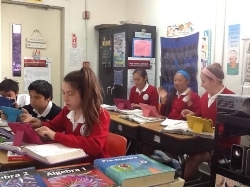 ADVANCED MATH Advanced Math is a specialty math class where students in the middle school accelerate to the next grade level. Classes are designed to accomplish a goal where 6th grade students complete pre-Algebra , and 7th grade students finish Algebra 1. Eighth grade students successfully complete Algebra 2, and are ready for Geometry in high school.